James Wisniewski has finally signed a deal with the New Jersey Devils. 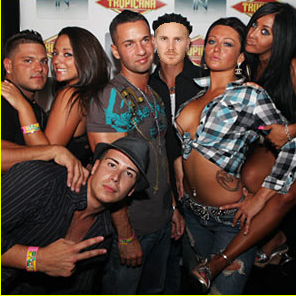 Reportedly the Devils got fed up and ended negotiations right before the season began as Wisniewski told them he was not interested in anything less than $8 million a year because he wanted to try out for Jersey Shore. Outraged that an average defenseman would want so much money, the team agreed to let him be a hold out to try and pursue his dream of a reality star. Wisniewski was in early tapings of the hit TV show this season, but that ended after an improv street hockey game on the boardwalk. "Wiz"'s team was losing early into the game after "Snooki" couldn't make 3 saves in a row in net. Angry, Wiz started to get more intense and started taking runs at Pauly and "The Situation". Soon, with his team down 4-0 and onlookers calling his haircut mid-western, Wisniewski went into a rampage and started grabbing castmates and bystanders and pounding their heads into the boardwalk. After cameramen and producers ran into the interrupt the brawl, Wisniewski was seen making gestures towards the other castmates. It was anticipated that the shows would test very highly, what with the fights and BJ gestures but it turns out people in Jersey just hate hockey and anything hockey related. So the producers decided that Wiz had to be kicked off the show and he came crawling back to the Devils. New Jersey already has 7 D-men under contract on the pro team, with guys like McQuaid getting the call early in the season to come up. The team has gone 21-14-9 without the reality failure, but decided his potential ability to move the puck and injure people was too much to pass up. Lowering his demands to just under 3 million a year for 2 years (really 1 1/2 year) the team decided it was good enough. Having run quite a it under the cap to this point, the team decided they could afford to pay him about $500,000 more than they wanted. At this point, with players like Hejda and Stralman struggling all season - Wisniewski will start on the 3rd pairing with Stralman plus some powerplay time, with Hejda getting 4th pairing duties and PK time. McQuaid will be a scratch for the next few games.